Back on November 16th (last Sunday), we headed up to Auburn airport so that I could use the gift certificate for a 1 hour helicopter lesson that Kathleen got me for my birthday earlier this year. 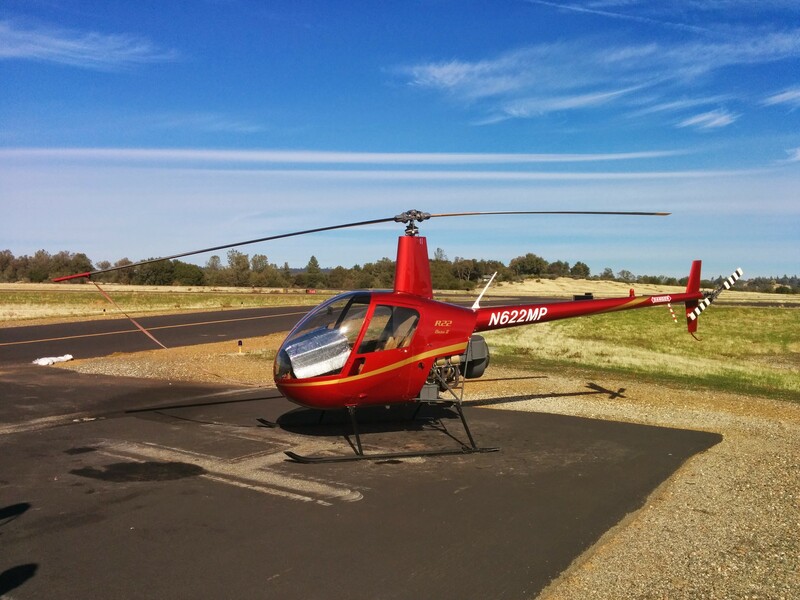 The plan was to fly in the Robinson R22 at Sierra Air Helicopters to get a feel for what it’d be like. Ever since our trip to Africa earlier this year, when we got to ride in a helicopter over Victoria Falls and then down into the the river canyon (video), I thought it’d be fun to try it out as a pilot. After a bit of a pre-flight briefing in John’s office (the instructor), we headed out to do the actual flying. Now, I have to say, I knew the most basic theory about how to fly a helicopter, but I’d never done any reading or practice before. I expected this flight to be a lot of him demonstrating things that I’d try and mess up. Since he had already done the pre-flight, we got in and he gave me a quick introduction to the gauges and equipment on the panel. Before long he had the engine started and was letting it warm up. When it was time, he asked me to raise the throttle so the governor would kick in and he could complete final checks. After he confirmed the chopper was ready to fly, he asked me to pull up on collective (that’s the lever my left that controls the blade pitch) and we were in the air! We flew down the taxiway parallel to Runway 25, began a climb to 500 feet AGL, and departed the area on a left crosswind leg. After about 10 minutes of flying around in the canyon, he asked me to pull up on the collective a bit so that we could climb up above the canyon walls and I could try my hand at flying it. 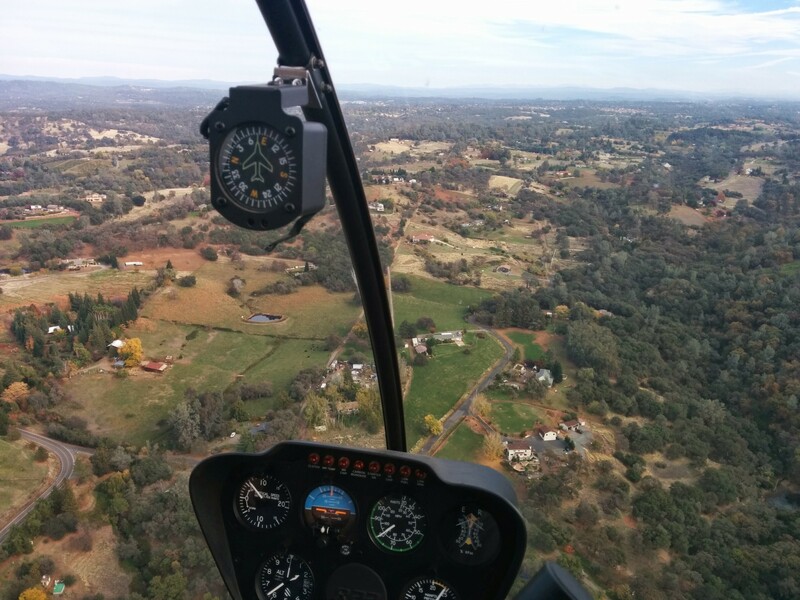 Much to my surprise, the R22 wasn’t as hard to fly as I had imagined (and had been warned). I found that if I kept my movements very small and gentle, the chopper responded in fairly predictable ways. So I flew mostly straight and level for a few minutes and then experimented with gentle turns. I continued doing that and working to refine my footwork (I kept wanting to say rudder, but it’s really the tail rotor I was controlling). As time went on, I tried more and more dramatic control movements and turns (but nothing too crazy). For quite a while, I was doing all the flying. John had relaxed to the point that his hands were nowhere near the controls anymore and he was telling me that people usually don’t fly this well on their first lesson. But since I was, he wanted to demonstrate a few more advanced things to me. 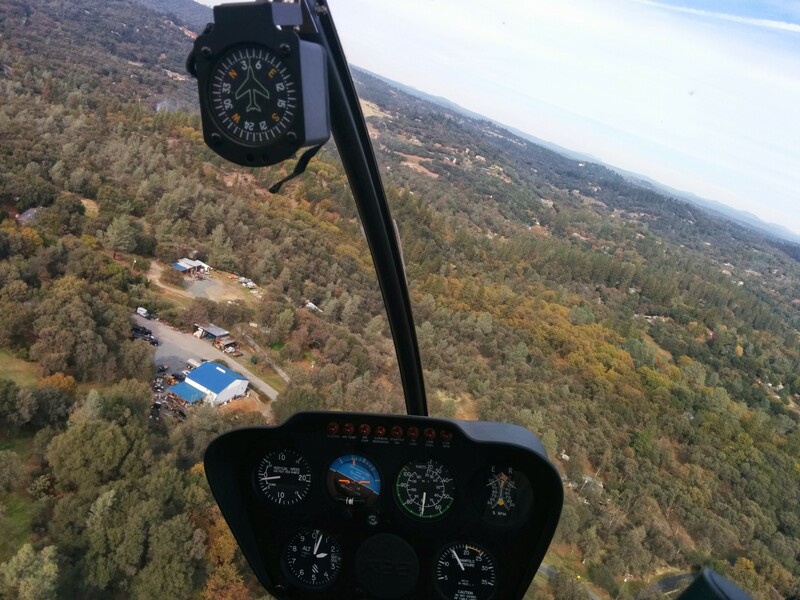 So he asked me to fly toward Folsom Lake where he could take us down lower and demonstrate a few maneuvers. 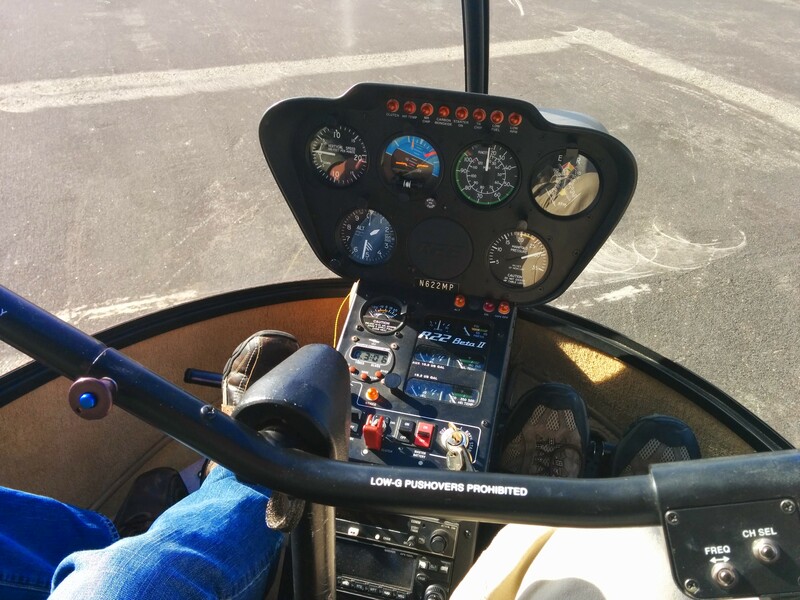 He demonstrated a few autorotations and other emergency procedures (as well as common mistakes) and the asked me to head back toward the airport so I could experience the joy of attempting to hover in place (one of the hardest things to master). 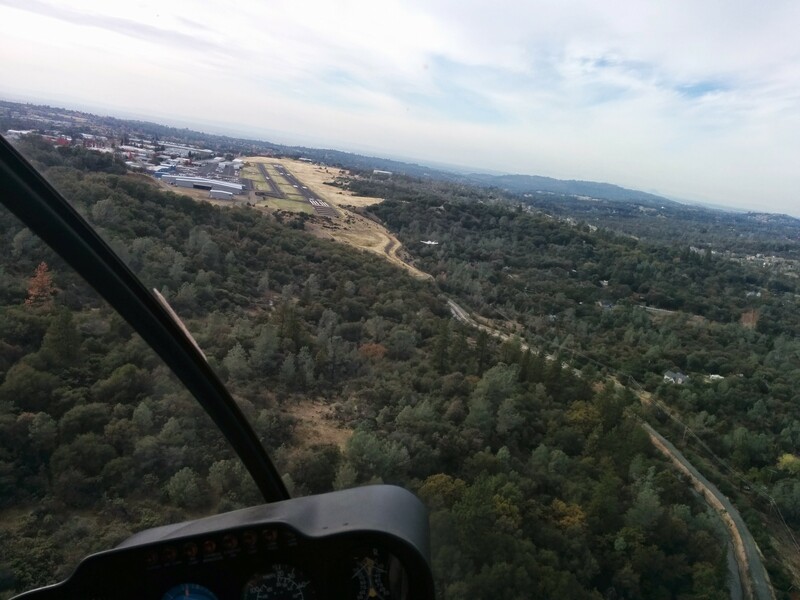 I got us to the downwind entry and he took over to fly the pattern and get us back over the helipad. Once we were stable there, he briefed me on what I was trying to do and then let me try keeping the helicopter over the pad. While I have no pictures of that portion of the lesson, Kathleen managed to shoot a video of my hover. In fact, I did pretty well with the hovering, so he pushed me a bit and had me perform a couple of takeoffs as well. And after I’d done a few rounds of takeoff to hover, he got us lined up over the taxiway and had me practice following the centerline while maintaining a relatively constant altitude. That worked out pretty well until I had to make a fairly sharp turn. I was able to do it, but I got a bit uncoordinated and also let it climb a bit too much. 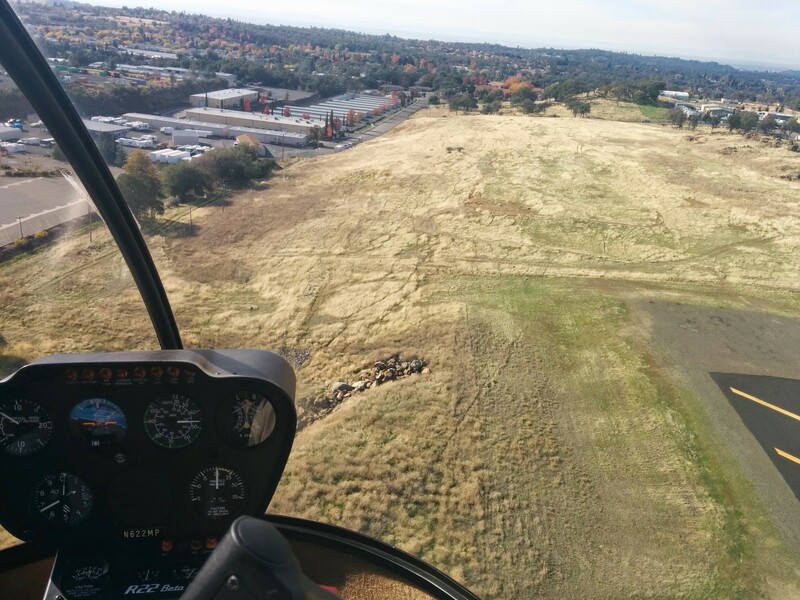 So he took the controls and put us down back in the parking area for the R22. Our hour was up. This entry was posted in Uncategorized and tagged flying. Bookmark the permalink.